To be honest, my night-time skincare routine hasn’t changed that much, I’ve just changed out and added in some new products that I now swear by! I try to do the below steps every night but to be fair I probably only do all of them five nights a week (as previously mentioned, I get very lazy sometimes!). In what order should you use your products? Please keep in mind these are just the products I use, if you use anything extra just send me a message and I’ll see if I can help you figure out where it goes in the running order! Kiehl’s – Midnight Recovery Botanical Cleansing Oil.. absolute mouthful! I can’t tell you how good this stuff is. It literally dissolves make-up and makes my skin feel expensive, if that’s even a feeling. It smells divine as well 🙂 I put one to two pumps in my hands, rub them together and then gently massage it into my face. I massage it in for about two minutes and then splash my face with water and the oil emulsifies and takes all of your make up off! You can pick it up in Debenhams for €35. This is full on a bar of soap! Yes, I wash my face with a bar of soap like I’m back in the 1920’s. Just a bit of context, at the end of last summer I had the worst break out, like it was there for weeks and wouldn’t go away. I used to suffer from acne as a teenager (really bad acne might I add) so of course I naturally went into panic mode! One of the girls (hey Liv!) 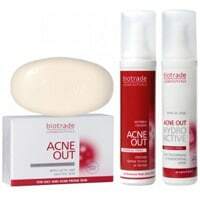 told me about this brand that clears up spots and acne. It’s called “Acne Out” and it changed my life! So, I got the package when I started. It’s €54.50 and you get facial soap, lotion and moisturiser. Once my skin cleared I stopped using the lotion and the moisturiser because the products are really strong and you shouldn’t really use them all the time if you don’t have spots. BUT I always use the soap just as a precaution 🙂 I rub the soap onto a damp face cloth and again, gently massage into the skin and then wash it away. You can find the Acne Out products that I used here. The Ordinary – Glycolic Acid 7% Toning Solution.. girls it’s so cheap and soooo good! Loads of websites stock it and it’s usually around €7.50 for a huge bottle. Glycolic acid is a gentle exfoliator and promotes glowy skin.. are we able? I think I told you before that I don’t like using beaded exfoliators because I think they’re damaging to the skin so this is the perfect solution for me! I use it with the big cotton pads you get in Penneys. We went through this in my last post (which you can read here).. the Clarins Double Serum! I literally can’t explain my love for this again, just get it. You won’t regret it! Clarins – Multi-Active Revitalising Night Cream.. I’ve been using this for a good while now and I really like it! Apparently this cream reduces the look of “lack of sleep” which to be honest I need haha! I get up at dawn every morning to go to work and refuse to go to bed early because I don’t want to waste my free time sleeping.. am I the only one like this? 😛 It also reduces the first signs of ageing, restores radiance, hydrates and maintains younger looking skin. My kinda cream ya know? €60 a pop but look it lasts ages! Last but not least, I use The Ordinary – 100% Plant-Derived Squalene. Don’t ask me what the name means please because I couldn’t tell you! Basically long story short it’s all about hydration. Have you noticed the on-going theme throughout my skincare routine? Hydration! This bad boy is only €6 and I absolutely love it! 99% of my skincare products are made with natural ingredients, I’m not a lover of putting harsh chemicals on my skin. Our skin goes through enough everyday without overloading it with chemicals!